Every now and again, the opera world gets to marvel in the thrill of excitement when a young singer makes their debut…but not any debut. A debut at the Metropolitan Opera is probably the most exciting of them all. 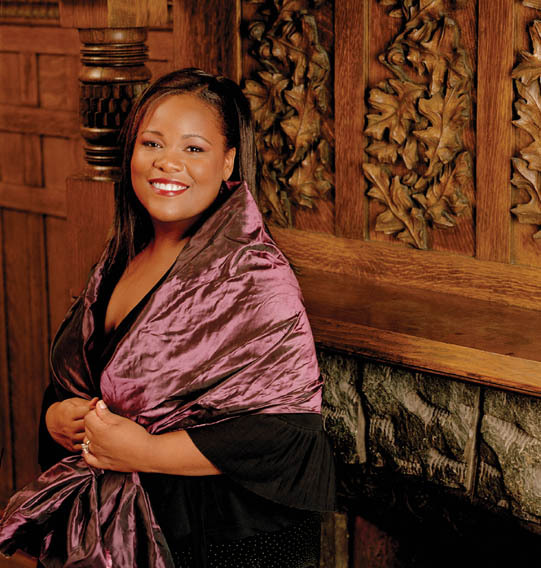 In a few hours, young soprano Latonia Moore will make her debut in a role that established many a great singer; Zinka Milanov, Renata Tebaldi, Leontyne Price, and Aprile Millo: Verdi’s magnificent Aida. In this historical and political opera, Verdi created three roles that are powerhouses of vocal prowess: Aida, Amneris, and in my mind, Amonasro, even more than Radames. This afternoon, Ms. Moore will sing Aida to Stephanie Blythe’s Amneris, Marcello Giordani’s Radames, and Lado Ataneli’s Amonasro. The performance will be conducted by Marco Armiliato. In Bocca al Lupo to Latonia! Born in Houston and raised in Texas, Latonia Moore began her study at the University of North Texas, originally planed to study Jazz. Fortunately for opera lovers, one of her teachers convinced her to study classical music. She continued as a student of Bill Schuman at the Academy of Vocal Arts, Philadelphia where she graduated in 2005.
what a wonderful performance of Aida being listened to on the radio on 3/3/12. The cheers of bravo are so deserving and exciting. I’m listening now. I almost flew up yesterday to catch this performance not knowing there was a cast change. I opted to fly up Monday for “L’Elisir” and “Don Giovanni” instead. One never can predict; I do wish I were in the house today. Moore’s performance is astounding – Price’s richness, Milanov’s clarity, and her own “take” on the drama. No wonder the audience rose to its feet following the first act. This was indeed a performance to cherish, and I deeply regret not being among those standing and cheering in the house this afternoon. She will be an Aida to stand along side the greats. Bravissima! I loved her performance! A great Verdi soprano. Truly an inspiring debut performance…BRAVISSIMA Latonia!!!! Just finished listening. I’m old enough and was fortunate enough to have heard many Aidas, starting with Milanov’s in the 40’s, and Moore’s performance, today, was one of the most exciting, ever. Especially heart-warming was the immense, welcoming, generosity of her fellow singers, and the outpouring of appreciation from the audience. May she continue to triumph. What a thrilling debut of a singer we hope to hear more frequently in future Met broadcasts! A rare treat indeed, and how glorious to be in on this beginning. .
Brava , Latonia !!! from David Sundquist at UNT You were Fabulous !! What a beautiful, golden performance! I wish this young “rising star” every good fortune and blessing. I’ve been a Met opera goer since 1959 and have heard a few great Aidas over those years. This afternoon, expecting Violetta Urmana in the role,I was at the extraordinary debut of Letonia Moore. A knockout performance by a great singer!WOW! What a joy to hear a fresh new wonderful voice! Bravo! What a joy to hear such a wonderful voice! Bravo! I’m not an opera-knowledgeable person ( the tickets were a present for my wife ) but even I could tell that this was a superb performance right from the start. A wonderful experience for me and my wife will forever thank me !!! Happy I was able to listen to the Met broadcast this morning. It was indeed a great pleasure to hear the the debut of Latonia Moore. I wish I could have been there for this wonderful preformance.. I too listened and found her astounding. What an opportunity for the rest of us opera lovers to hear a upcoming star. She was marvelous! Hope to hear more of her in future. Here in the Mexican High Sierra, I listened to the Met broadcast of Aida, and because I’d heard so many, I wasn’t going to stay listening. But from the moment Srta. Moore opened her mouth, I was transfixed and remained glued to the entire opera. What a treasure she is! And how, like her fellow Texan, “Siegfried” Jay Hunter Morris, she must have glowed inside at the response to her stunnung debut, because I was in tears! How lucky were those to have been present! I had no idea when we went to see Aida yesterday that there was a new soprono singing the role. We were transfixed! What a beautiful voice. I needed to look up the name today. This is great ! It is a pleasure meeting you, I give thanks to God, to discover you among the teeming passengers standing across the road. I wish I knew you better. From Ajibade Omolayo, cheers.